The Yi 360 VR release date has been delayed a bit further. However, I’ve been assured that it will be released in November “100%.” The good news is that this gives us the opportunity to preorder at $399 before it is released for $499. 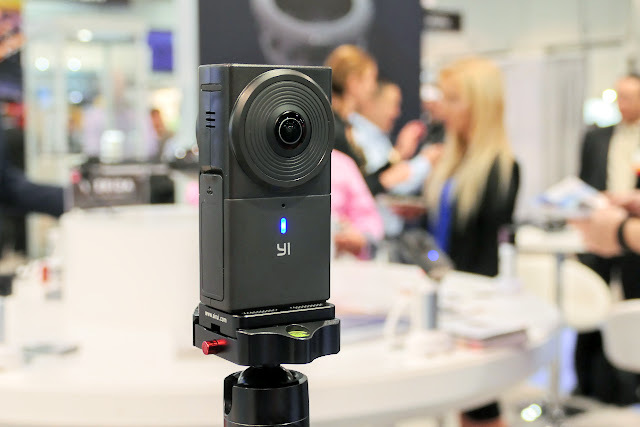 The Yi 360 VR is one of the most highly anticipated 360 cameras. When it was announced at NAB Show 2017, it surprised everyone because it offered 5.7K video, the highest resolution in a consumer 360 camera at the time. It was originally to be released in June but was delayed to October. Now it is being delayed once more to November, but my contact assured me that it would definitely be released in November “100%.” I asked if it would be November 11 as rumored, and my contact said that is not true. I also think it is a capable camera for real estate because of its exposure controls (can control ISO and shutter speed), its feature for automatically erasing you from a photo, and its support for Google Street View Mobile. 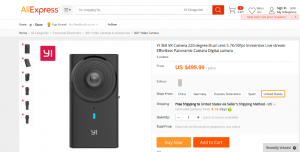 Yi 360 VR is still available for preorder for $399 from B&H Photo, whereas the retail price would be $499 (in fact, that is the current preorder price on Yi’s store on Aliexpress). I was told it would also be available on Amazon in the future. One lingering question is whether it will have built-in stabilization. That has been denied by my contact (even for the final version), and my preproduction unit definitely doesn’t have stabilization. If you have any other questions, please let me know in the comments. Sigh. Oh well, I’ve waited this long. Hopefully worth the wait. Any rumor of it being any level of waterproof, or them seeking an IP rating? Hi James. No, it’s not waterproof. Drat. I’m looking for a good 360 camera to to take on a cruise in December. This one is SO CLOSE to perfect!!! Even if it “only” had an IP67 rating and could handle getting splashed. Guess it’s between the Madv360 or a Keymission. I’m surprised more 3608 cameras don’t have a waterproof housing accessory. Hi James. Between those, I would get the Madventure (or Xiaomi). Much better photos and videos than the Keymission. The Keymission’s only advantage is that you don’t have to stitch photos or videos, but that’s offset by the difficulty in connecting with the app. The winner among these cameras will depend on the package stabilization+editing software. Who will give the better overcapture/freecapture capability to select a 16:9 video out of it. Thanks for your patience Denzel. B&H are still sticking to early December. I’d rather buy direct from Yi but each time I attempt to preorder from their site, I’m given an email that tells me to wait for them to contact me. I’ve done it many times now without any real confidence they’ll follow up.